At the time of writing, we have just witnessed how the strongest member states of the EU, led by an inflexible German government, humiliated Greece without mercy, as a warning to other potential targets. As far as we know, Europe’s version of a Greek tragedy is far from being over. Even though the majority of Greeks have voted for an end to austerity, the same strand of self-defeating and socially destructive policies awaits them. It seems doubtful the country stands any chance of ever paying back its debt on its own. Whatever fancy names we might find for the forms of humiliation a member state has to undergo when dealing with the more powerful (be it Grexit, Graccident or aGreekment), none will hide the fact that today’s politics at the European level has nothing to do with solidarity anymore. Europe is driven by a power game, whose rules are defined as “one (neoliberal) size fits all”, and the less fortunate are left alone with their problems. And this is not to say that Greeks have done everything right. Their economic model was unsustainable for many decades and it is still in dire need of reforms – and frankly, we don’t know if Syriza would have been able to make the necessary changes – but none of these can justify the forms of repressions we have witnessed recently. For now the Greek patient is back on life support, but the doctors keep switching the machines on and off, saying this is how you can improve someone’s condition most effectively. Not surprisingly, the repression of a weaker member state comes at a time when the construction of the European Union is already more fragile than ever before. In addition, new forms of cultural regression manifest through the rise of intolerant, xenophobic and Eurosceptic movements, who are doing their best to destroy half a century of patient and complex European construction. And instead of protesting, the electorate seems to have accepted that all is going down the drain: all we get is a “post-democratic lulling to sleep of public opinion” (Habermas). This is why it is more important than ever for committed Europeans to stand up and raise their voice, to work on alternatives, and to build trust and solidarity among the member states. Those who feel uncomfortable in today’s Europe and those who disagree with the directions dictated by the financial orthodoxy need to work even harder in order to change the “European model”. To create a Europe that is based on the currency of values rather than the value of currency. A Europe that unites, rather than divides people. After the end of World War II the European Community was born out of one simple idea: the founders hoped to overcome nationalism and the chauvinistic confrontations of the previous decades by creating a commonwealth of European nations. They knew that in order to achieve this they needed to create solidarity through a system of interdependencies between the societies of Europe. In spite of France’s rejection of a defence community in 1954, the founding members managed to set up a common market, which became the basis of the post-war economic model – “the social market economy”. This, as Wolfgang Streeck, Emeritus Director of the Max Planck Institute puts it, was a time when social regulations were forced on capitalism, even if capitalism itself didn’t feel comfortable with them. This is why, following the years of post-war reconstruction, capitalist elites and their economic allies decided to find ways to get out of their social commitments, thereby paving the way for the neoliberal reforms of the 80s and 90s, the third way of social democracy, a large set of crises, and now the diktat of the Troika over Europe’s crisis-stricken economies. It is always possible to doubt the viability of the whole construction of a social market economy, as if the temporary coexistence of social standards and the market were all doomed right at the moment of their birth. But neither we, nor any progressive political actor, should condone such lazy scepticism. Our kind of Europe is a community of cooperation, of peace and solidarity, on the basis of the acquis already achieved by the EU. After all, the Treaty of Rome was ratified almost 60 years ago, and since then the community that was built around the former arch-enemies France and Germany has remained an island of peace – a great achievement taking into consideration that we had wars in the Balkans and in Ukraine, both right at the EU’s borders. Furthermore, this ailing construction remains a powerful force of attraction for many on the outside: countries in its neighbourhood are still hoping to join the common table, while thousands fleeing war or poverty in the global South are trying to set foot in the EU, in hope of a new, better and peaceful life. This is something that we need to appreciate. And something that we need to keep in mind when forming European policies, as we have learned from current history that nothing human-made is irreversible. If we don’t pay attention, Europe might easily lose itself, its purpose and its existence. 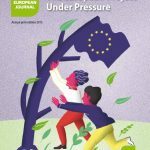 While these above mentioned groups seem to have a well-defined position inside the machinery of Europe, the Greens are today disoriented and utterly divided: some of them are more or less radical in their demands for a new Europe of solidarity, cooperation and sustainability, others rather position themselves as pragmatic reformist, hoping to transform Europe step by step, in accordance with the majority. And while there would have been a great need for us Greens to step up, we couldn’t really influence the course of politics in the EU. Today we resort to a merely defensive approach. Greens might have ideas on how to improve policies, though they seem to have no clear vision of the kind of Europe we want to live in. Do we want more integration? And if so, which kind? Do we want to live in a federal Europe? The answer is most likely yes. But we don’t voice our opinions loud enough, we are not even sure how to express our thoughts, and thus end up being some of the all too quiet reformist voices trying to push for new integrationist projects, for tax harmonisation, for a modest reform of the monetary union, or for policies to welcome and distribute refugees in Europe, which – as desirable as they are – risk falling short of having an influence on the path of Europe. And so the systemic problems go on as if no one had noticed them: the Greek crisis and the refugee crisis are just two examples of the catastrophic outcome of this inaction. At least since the signing of the Lisbon Treaty, the “common market” seems to have fostered not only competition but also co-operation amongst the member states – but the innovation of the euro, which was supposed to further unite the societies of Europe, didn’t work the way it was expected. The malaise this caused has been further accelerated by the crisis of the financial and banking sector, and has accentuated the differences between member states, their governments and public opinion in the EU. This in turn has led to a situation in which fundamental principles of the EU, the free movement of persons and the free movement of workers are being constantly questioned, and the EU’s current stalemate seems to drive us back to a national logic, in which nothing else matters but brute force in negotiations and the performance of national economies. At this moment, it looks like Europe and its institutions are going to resist the changes that would prepare the community for an adequate response to the constraints and challenges of increased globalisation. While it would be more than necessary to go on with deepening the integration process of Europe, in order to effectively tackle the global challenges looming at our community. Europe seems to be paralysed, unable to deal with its internal imbalances and global challenges. It is desperately depending on the remnants of the long overcome nationalistic periods. It would be our task now, as Greens, to come up with a vision and lead the way for Europe to overcome this current stalemate. We need to act, before it’s too late. Because it is Europe that is at stake.